PIOLHO (LOUSE) is the 3rd. 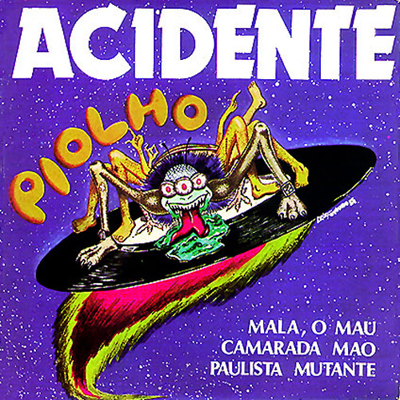 vinyl released by ACIDENTE, the Brazilian independent rock band. It's an EP with four songs, all of them fine and written by Paulo Malaria, who also produced it (except Piolho, by Paulo Malária / Helio 'Scubi' Jenné)!! It's perfect for rock and rolling. Paulista Mutante is another great rock with a great riff. Camarada Mao is a true party and Mala, o Mau, a big bang! Before this record, ACIDENTE had already released two independent vinyls: GUERRA CIVIL (1981) and FIM DO MUNDO (1983), both produced by Malaria, ACIDENTE's main composer and keyboards player. Still, accordingly to Malária: "These tracks would be part of a 3rd album called "Matando a Pau", but this 7' was made in a hurry to prevent some song stealing. Moreover, times had driven harsher yet for indies. 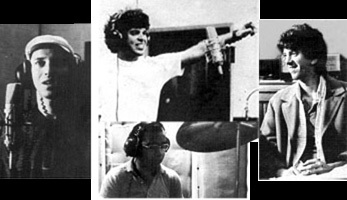 Then, after this teaser's release echoed like a stone thrown on the water, the band lost its motivation: one by one, members left the group and, although some recorded sessions took place until the following year, at the end, the LP never came to exist. Soon Old Aça disbanded, leaving only pictures in mind and piles of unsold vinyls. for the International Youth Year (1985). All rights reserved by the producer of this record. (this only works in native language). yeah, eu sou o mau! Mas não é nada disso, eu sou é "himper mau"
É, quem mais querem falar mal? Dizem até que eu sou himper mau! A onda agora é patrão. Cha cha cha cha Tchau! Orra que displante, que raiva que dá!